Light and refreshing. Everybody loved this cake. 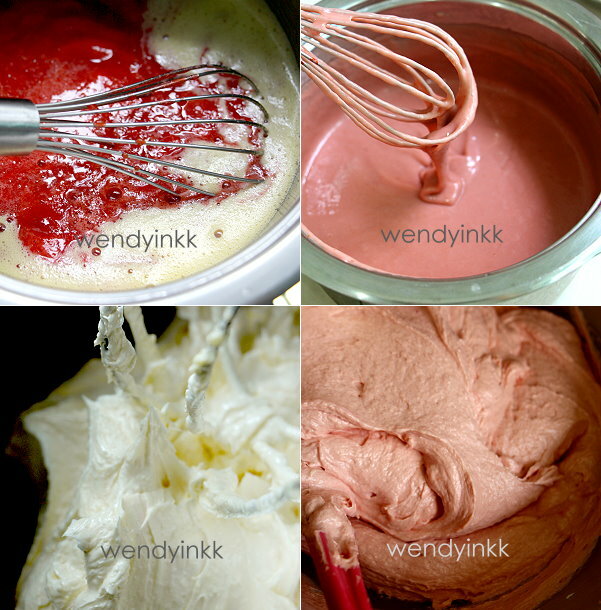 I like to make flavoured buttercreams by using the cooked buttercream method because I can incorporate flavours without worrying about making the buttercream way too runny. 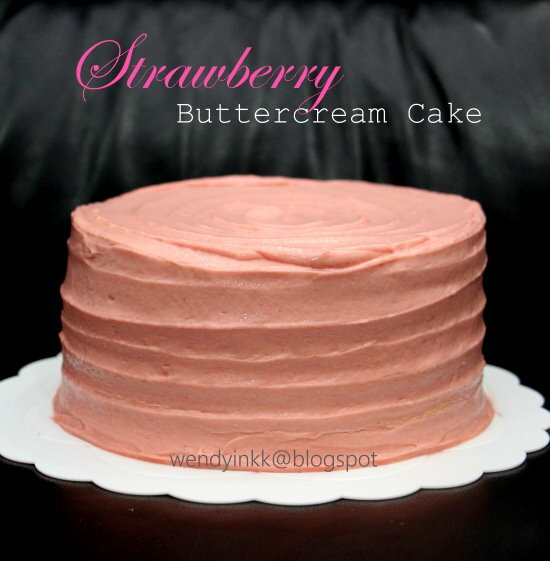 Cooked buttercream is also lighter in taste but it is not as stable as meringue based buttercream. Just keep this cake well chilled, and it will be alright. 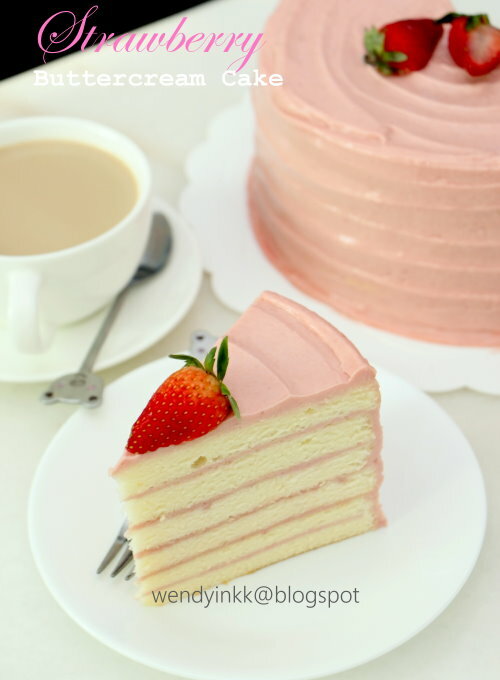 I used red ripe strawberries from Cameron Highlands to prepare the cream. I love how strong the colour turned out. Please take note that this cake's final outcome is around 6 inches tall. And the cream does not stay well for long in tropical room temperature. If the cake is put in a cool room, it will be alright as long as it's kept cool. But if Malaysia's room temperature, do not leave it around for more than 1 hour, or it will be a very messy cake to slice. 1. Line the base of three 2 inch tall pan (8 inch diameter). Very lightly grease the sides. 2. Preheat oven at 180C. 3. Mix egg yolks, vanilla seeds, vegetable oil and sugar together. Then add in water. Mix. 4. Sift flour together with cornstarch and baking powder into the yolk mixture. Mix until smooth. Set aside. 5. Prepare meringue. Beat egg whites until frothy. Add in vinegar or cream of tartar and beat until soft peaks. Gradually add in sugar and beat the meringue until stiff (hooked). 6. Add 1/3 of the meringue into the yolk batter and fold. Add another 1/3 of the egg whites and fold. 7. Pour the yolk batter into the remaining meringue and scrape the yolk batter bowl clean. Fold the batter until even with quick strokes. 8. Pour the batter into the three lined pans and level. 9. Put into the oven on the middle rack, and bake for 30 minutes or until done. 1. Coarsely chop the strawberries and cook with water until the strawberry turns mushy and puree it. Weigh it and make sure there is at least 320g. If there is too much, you can cook it to reduce the water content. 2. Beat egg yolks with sugar until very foamy. Mix flour with milk until smooth and pour this into the egg yolks. Add in 320g strawberry puree, Cook the mixture on medium low heat* until it turns thick and cooked, like a really thick cream soup (visual consistency almost like ketchup). Add in butter and mix. 3. Let the paste cool down, stirring it every now and then to prevent caking up until room temp. 4. Cover the surface of the paste with cling film, and chill until cold. 5. Beat butter and sugar until pale and fluffy. 6. 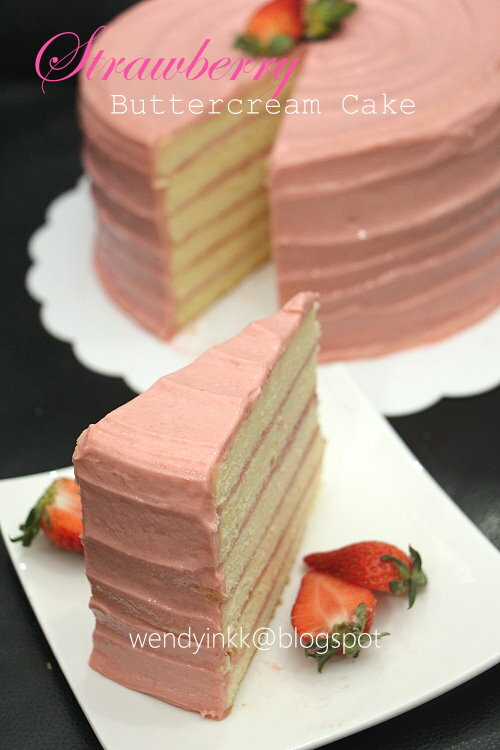 Add in cold strawberry custard paste and beat it until the cream is all smooth and fluffy. 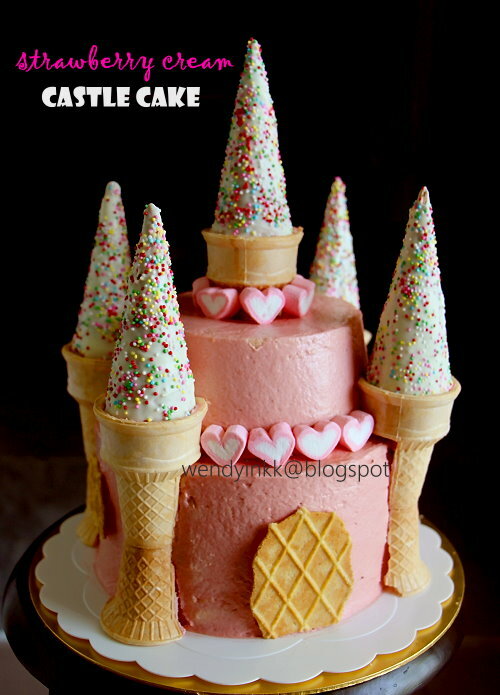 This is the recipe for the Castle Cake below. Depending on how large it is, please adjust the recipe accordingly. For this castle, I made 1.33 of the cake recipe and but with the same amount of cream. The upper layer of the cake isn't filled inside. 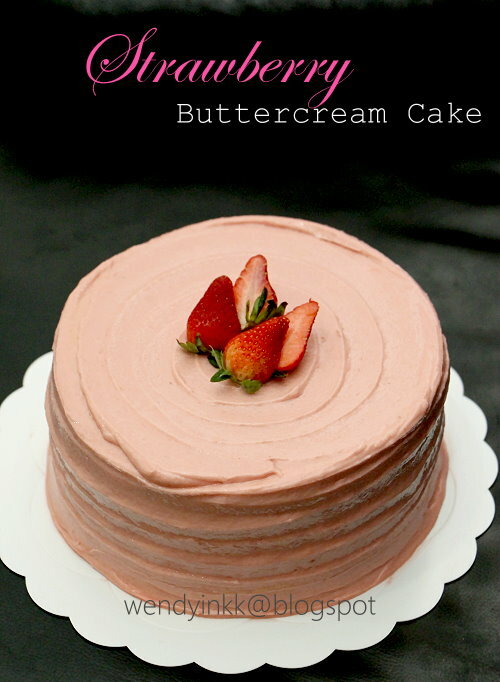 If I prepare the buttercream in advance for use the next day, do I have to keep it in the freezer or the lower fridge section? Please advise. Thank you! Fridge will be just fine. Because you will be keeping the finished cake in the fridge as well right? There's no need to freeze unless it's going to be more than 3 days.